A country store, several fine churches, and a Town Hall make it look like many other pleasant Cape Cod towns, but Nickerson State Park makes it different. Brewster is one of the picturesque little towns on the north shore of Cape Cod along MA Route 6A facing Cape Cod Bay (map) with several seaside resorts, hotels, motel and inns, not to mention the 400 campsites in Nickerson State Park, and a number of cultural institutions. 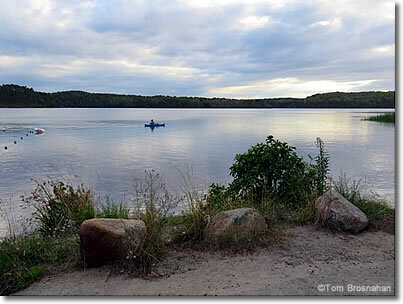 Wholly within the boundaries of the town of Brewster, the 1900-acre (769-hectare) Roland C Nickerson State Park is a Cape Cod anomaly: a non-commercial forested nature and recreational reserve boasting eight freshwater glacial kettle ponds. Brewster is proud of its historic grist mill and herring run on Stony Brook Road near the intersection with Satucket and Run Hill roads. The 19th-century mill is now part of a park owned by the town of Brewster. The waterwheel, still in good working order, powers the grinding machinery inside the mill. You can watch the whole process at work, and buy freshly ground cornmeal, from 2 to 5 pm on Wednesday, Friday, and Saturday afternoons in July and August. Upstairs there's a small museum with artifacts from the "Factory Village" which occupied this site over 100 years ago. Those interested in Cape Cod's flora, fauna, and ecology will want to visit the Cape Cod Museum of Natural History, 869 Route 6A (tel 508-896-3867). The museum organization was founded in 1954 to preserve the wildlife and plant life in the area around Stony Brook and its marshes, to study this land, and to teach others about it. 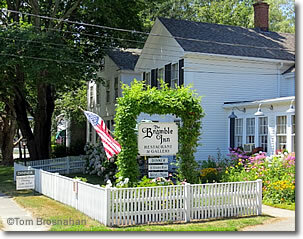 The Bramble Inn & Restaurant, Brewster.